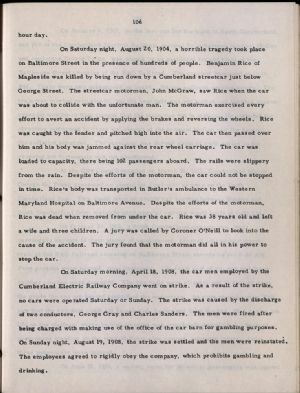 On Saturday night, August 20, 1904, a horrible tragedy took place on Baltimore Street in the presence of hundreds of people. Benjamin Rice of Mapleside was killed by being run down by a Cumberland streetcar just below George Street. The streetcar motorman, John McGraw, saw Rice when the car was about to collide with the unfortunate man. The motorman exercised every effort to avert an accident by applying the brakes and reversing the wheels. Rice was caught by the fender and pitched high into the air. The car then passed over him and his body was jammed against the rear wheel carriage. The car was loaded to capacity, there being 102 passengers aboard. The rails were slippery from the rain. Despite the efforts of the motorman, the car could not be stopped in time. Rice's body was transported in Butler's ambulance to the Western Maryland Hospital on Baltimore Avenue. Despite the efforts of the motorman, Rice was dead when removed from under the car. Rice was 38 years old and left a wife and three children. A jury was called by Coroner O'Neill to look into the cause of the accident. The jury found that the motorman did all in his power to stop the car. On Saturday morning, April 18, 1908, the car men employed by the Cumberland Electric Railway Company went on strike. As a result of the strike, no cars were operated Saturday or Sunday. The strike was caused by the discharge of two conductors, George Gray and Charles Sanders. The men were fired after being charged with making use of the office of the car barn for gambling purposes. On Sunday night, August 19, 1908, the strike was settled and the men were reinstated. The employees agreed to rigidly obey the company, which prohibits gambling and drinking.